Find hotel near St. Thomas Mount National .. Sitting pretty in Chennai’s neighbourhood of Guindy, the St Thomas Mount is this gorgeous little tiny hillock. The church has significance that relate to Syria. There are traces of the Syrian Christian’s church here with regard to St. Thomas the Apostle. The entire area has this characteristic vibe to it, given its being as one of the Chennai areas, that were highly populated by the Anglo-Indians in the 17th century. Under this church lies another church of The St. Thomas Garrison. Its close proximity to the Chennai airport is an added benefit to make for a quick visit. There is a weekly retreat on every Sunday of the month. How popular is St. Thomas Mount National Shrine? 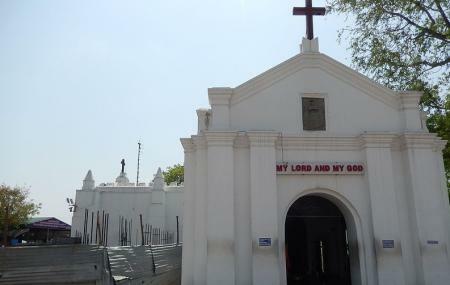 People normally club together Ashtalakshmi Temple and T Nagar And Ranganathan Street while planning their visit to St. Thomas Mount National Shrine. Apostle Thomas, Disciple of Jesus Christ was Martyred here. This place has historical significance and is patronized around the world. Great place to relax, meditate and unwind. The scenic top view of the city is worth the trip! By Dream It, Be It! You get awesome view of the City. Inside the worship place...... you get peace. I love the architecture too. Acoustics of the room is awesome and it helps you to feel and experience your soul.